With a Microsoft-mandated deadline a little more than two months away, computer makers are still selling PCs equipped with Windows 7 Home Premium. Hewlett-Packard, for example, has several PCs, including some it's discounted for students, equipped with Windows 7 Home Premium, the most popular version for consumers. The HP Envy 15t-j100 notebook was on sale this week for $729.99, a 19% reduction from its usual $899.99, as was the HP Envy 700-215xt desktop, discounted by 20% to $679.99. Both included Home Premium. HP made a bit of news in January when it kicked off an online promotion for several consumer Windows 7 PCs with a tagline that the four-year-old OS was "back by popular demand." 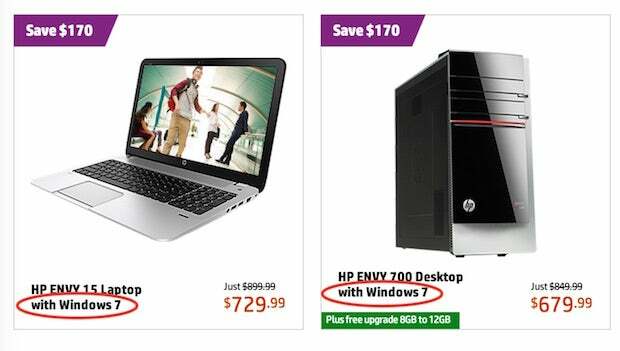 On its sale pages Wednesday, HP touted Windows 7 as "a familiar and intuitive environment." The two other OEMs (original equipment manufacturers) in the top three worldwide -- No. 1 Lenovo and No. 3 Dell, according to second-quarter shipment estimates by IDC -- also displayed Windows 7 PCs on their websites that target students or home computer users. OEMs have another two months of consumer-grade Windows 7 PC sales before Microsoft yanks the operating system from their factories. Earlier this year, Microsoft set Oct. 31 as the end-of-sales date for new Windows 7 PCs running Home Premium. Before that, the company had first posted the date, then retracted it, then restored it but only for consumer systems. At the time -- as well as today -- Microsoft left the date blank for the halt of Windows 7 Professional installed on new PCs, saying only it was "not yet established." In February, Microsoft said it would give one-year notice before it demanded that OEMs stop selling PCs with Windows 7 Professional. Under that rule -- and since Microsoft has yet to deliver the promised warning -- computer makers will be able to continue selling PCs with Windows 7 Professional until at least August 20, 2015. An even longer extension is certainly possible unless the next edition of Windows, code named "Threshold" for now and perhaps officially labeled "Windows 9," is a big hit. Threshold is expected to launch next spring. Even then Microsoft will probably let OEMs sell commercial PCs with Windows 7 Professional for some time: That version became the standard for businesses as they got rid of their Windows XP machines and spurned Windows 8. It's not surprising that OEMs continue to market Windows 7-based machines, or that Microsoft has extended their use of Windows 7 Professional by 10 months so far. PC sales have been in a two-year slump -- down 10% in 2013 from the year before, IDC said, and forecast to be off another 6% this year -- and neither OEMs nor Microsoft are going to pass up selling systems, even if that means the computers run a five-year-old OS. That age is one downside of buying a new PC with Windows 7, as Microsoft will stop serving security updates -- patches for newly-found or -reported vulnerabilities -- after Jan. 14, 2020. While that is more than five years away, it's near enough that Gartner has already called on companies to begin planning how they will migrate off Windows 7. On the plus side, just half the usual 10 years of support for late-comers to Windows 7 will be 67% longer than the 3 years that Apple seems to have settled on for supporting its operating system, OS X. Windows 8, the 2012 original, also has an approaching deadline: On October 31, retail sales of Windows 8 are to stop. PCs with Windows 8 may still come off the factory lines -- Microsoft has not set the end-of-sales date for OEMs -- but that point is largely moot as the perception-challenged OS has been largely replaced by Windows 8.1 on new machines.